2010 October. 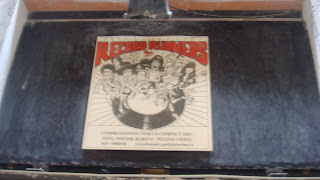 Genova, Italy Shop: Record Runners The only second hand LP shop in town that I could find. Nice people, nice small shop, they were in the middle of expanding or remodeling when I was there. High prices. I bought one Joe Jackson LP, a Yugo pressing for 10 Euros and nothing else. One of the owners gave me an Iron Maiden collector book he wrote. Nice thick book, grazie.